The history of Renault trucks dates back to 1894, when Marius Berliet designed and constructed single cylinder engine and his first petrol car. In 1906, he constructed his first truck. Renault has been collecting the experience for over 100 years, while constantly innovating its technologies. Finally, in 2013, Renault introduced and launched four new truck ranges covering wide scale of applications. Renault Trucks T are suitable for national and international long-haul transport, Renault Trucks K for heavy-construction usage, Renault Trucks C for construction sites and Renault Trucks D for distribution. The model names correspond with their engine ratings (e.g. the T 380 truck is rated at 380 hp). The T-range of Renault trucks, launched in 2013, includes two long haul vehicle subranges; Renault T High range (3 models) and T range (6 models). 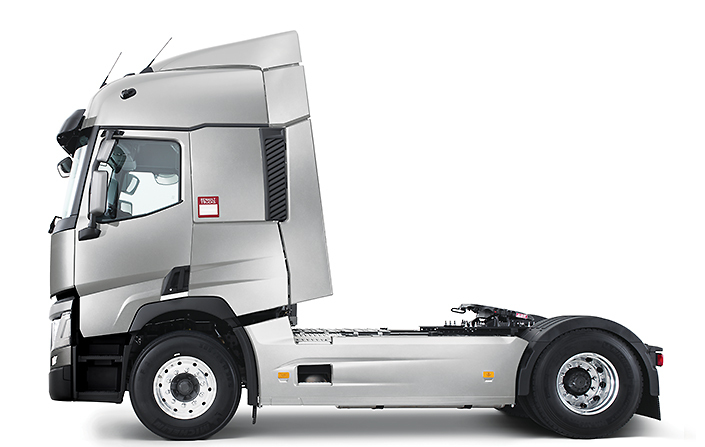 All Renault Trucks T implement an aerodynamic design, robust components, and reinforced cab and chassis. Renault Trucks T also provide onboard comfort, cab with ergonomic features and lot of storage space. The standard wheel drive configurations are 4x2 and 6x2 (rigid and tractor). The T High range is suitable for batch transport (long-haul). It is equipped with DTI 13 engine rated at 440/480/520 hp (Euro 6). The gross combined weight (GCW) of Renault T High models ranges from 40 to 70 tons and the gross vehicle weight (GVW) from 19 to 26 tons. Renault offers the high sleeper cab for the T High range of truck, which is a comfortable cab with bunk, high roof and flat floor, suitable for long-haul transport. Renault Trucks T can be equipped with DTI 11 (380/430/460 hp) or DTI 13 (440/480/520 hp) in-line 6-cylinder engines, meeting the Euro 6 emission standards. The gross combined weight of Renault T models ranges between 40 and 60 tons and the gross vehicle weight from 18 to 26 tons. Renault offers those cabs for the T-range; the day cab (standard roof), night and day cab (cab with bunk, standard roof) and sleep cab (with bunk and high roof for maximum comfort). Renault T-range is suitable for batch transport, car transport, tanker transport and also temperature-controlled transport. All Renault T-range trucks are equipped with Optivision, which is a cruise control system with GPS for optimized gear changing. This is the range of heavy-construction Renault trucks, including 6 models and their configurations. The K-range trucks are equipped with heavy-load designed chassis, which leads to reduced number of return trips; therefore, additional cost saving. Renault K 380-520 range is suitable for concrete transport (mixer), earthmoving, logging transport, mining and also transport of goods. Depending on the configuration and usage (8x4 rigid/6x4 tractor), the K-range is powered by DTI 11 (380/430/460 hp) or DTI 13 (440/480/520 hp) engines, being Euro 6 compliant. The gross combined weight (GCW) of Renault Trucks K ranges from 40 to 120 tons and their gross vehicle weight (GVW) ranges between 18 and 50 tons. The K-range offers ergonomic cab with automatic equipment for maximum drivers’ comfort. Renault Trucks K are compatible with the day and night and day cabs. Renault Trucks K feature off-road mode, that is dedicated to driving on construction sites. Moreover, Renault offers the K Xtrem version with payload of 34 tons, which is built for usage in the most challenging environments. The C-range is the construction range of Renault trucks, suitable for concrete transport (8x4 rigid configuration, capacity of 9 m3), earthmoving (6x4/8x2/8x4), transport of goods (4x2/6x4) and transport of materials (8x4 Tridem/6x4). The 8x4 Tridem configuration is more maneuverable than the standard 8x4 and provides greater loading capacity than the 6x4 configuration.The C-range combines the drive comfort of a long-haul (T-range) vehicle with robustness of a construction truck, offering reliability and reduced fuel consumption. Renault Trucks C can be equipped with three Euro 6 engines; DTI 11 (380/430/460 hp), DTI 13 (440/480/520 hp) and DTI 8 (250/280/320 hp). The C-range is divided into two truck subranges by the width of cab — 2,5 m and 2,3 m wide models. The gross combined weight (GCW) of the wider cab models (2,5 m) ranges between 40 and 100 tons and the gross vehicle weight (GVW) from 18 to 33 tons, whereas the GCW of the narrower cab (2,3 m) models ranges from 18 to 44 tons and their GVW from 18 to 26 tons. Renault Trucks C are compatible with the day, night and day, global and sleeper cab types. The D-range is the distribution range of trucks suitable for car transport, tanker transport and temperature-controlled transport. Renault Trucks D are further divided into D and D Wide models with 4x2 tractor, 4x2 rigid and 6x2 rigid drive configurations. Renault D Wide trucks are equipped with 6-cylinder DTI 8 engines (Euro 6) rated at 250/280/320 hp, their gross vehicle weight (GVW) ranges from 18 to 26 tons and the gross combined weight (GCW) from 21,5 to 44 tons. The D Wide trucks offer 2,3 m wide cabs of those types; day, global, night and day and sleeper. The second group of models, D trucks (2,1 wide cab), are equipped with DTI 5 (210/240 hp) or DTI 8 (250/280 hp) Euro 6 engines. 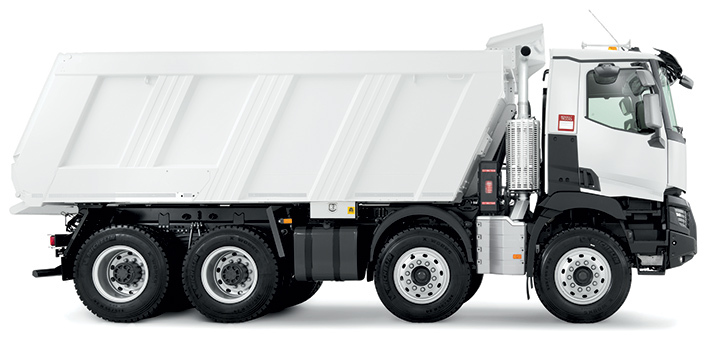 The GVW of D models ranges from 10 to 18 tons and the GCW from 13,5 to 36 tons. Renault offers the day, global and crew cabs for the 2,1 cab wide D-range of distribution trucks.